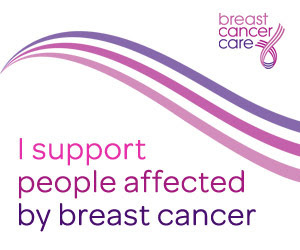 This is a cause that is very close to my heart as I lost my Mum to breast cancer nine years ago. She was diagnosed at the age of 36 which is considered quite young. She had a couple of operations and various treatments and was given the news that it was in remission. A couple of weeks before her five year 'all clear' appointment it was found that the cancer was back, was aggressive, was already spreading and was considered terminal. My brave Mum kept fighting until she had no fight left and at the age of 45 she died at home with us. This isn't going to be a sob story post - I'm not looking for any sympathy. All of this happened a very long time ago. But the fact of the matter is that breast cancer is becoming more common. When my Mum was diagnosed almost 19 years ago, it was one of those things you'd heard about but always assumed happened to Other People - not your own family. But current statistics show that around 550,000 people in the UK are living with breast cancer right now. Around 50,000 cases are diagnosed every year - during October around 4,000 people will receive the devastating news that they have breast cancer. And it's affecting younger women. Although 80% of breast cancers occur in women over 50, it's also the second most commonly diagnosed cancer in women under 35. So it's extremely important that you know how to check your breasts ... and you do it. During October there will be a post or two that focus on breast cancer charities and the help and advice they can offer to those affected by the disease. I'm not going to let breast cancer dominate the blog but it would feel wrong to let this month go by unmarked in this little patch of the internet. I know that when my Mum was going through it, I wanted to know what help was out there, for her and for us. If you don't want to read these types of post, don't worry, I won't be offended! But I'm sure you will understand that it feels important to me to do my little bit to raise awareness. It's not all bad news, although the number of people diagnosed with breast cancer is increasing, survival rates are increasing too as we understand more about the disease, are more aware of it and the treatments are improving. But EARLY DETECTION IS KEY so it's SO important that we check ourselves regularly and know what is normal for us, so that any changes can be flagged up early. OK, lecture over. I hope at least one of you will find something useful in these posts this month, if not for yourselves then for someone you know. I hope that you'll start checking your breasts, consider buying a pink ribbon or one of the hundreds of 'pink products' that will be everywhere this month or sponsor or take part in one of the many events that will be held around the UK. And when you do, you'll know that you've done your little bit to help.